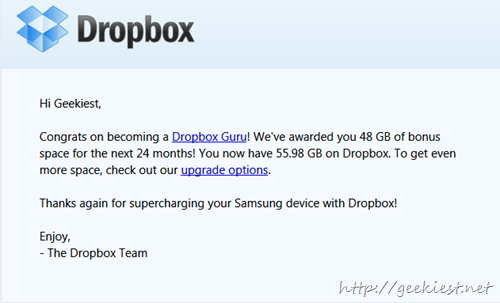 Earlier we have posted about free 50Gb Box.com account for android users, Now it is dropbox. Today I just installed the new leaked Samsung Jelly Bean (4.1.2)Firmware for Samsung Galaxy S2. (It is cool). It is having inbuilt dropbox application and I just logged in using my Dropbox account, and yes I Got 48GB of additional space Free for two years. I have read this offer for Samsung Galaxy Note II and Samsung Galaxy S III. Just came to know this offer will be coming for Samsung galaxy S II also. Get Lego The Hobbit free from Humble Bundle, and Full Throttle Remastered free from GOG.